Now that I’m well into my third pregnancy, I feel like I’ve finally nailed down my bump style. I’m definitely one of those who likes to show off the bump, but I also like to dress comfortably and practically. 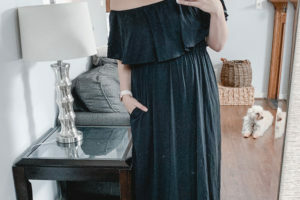 My go-to maternity outfit is the perfect combination that can be recreated in so many ways. It’s truly my favorite outfit combination that I return to time after time for everyday mom life! Since we’re in early spring, most days I reach for my maternity jeans. 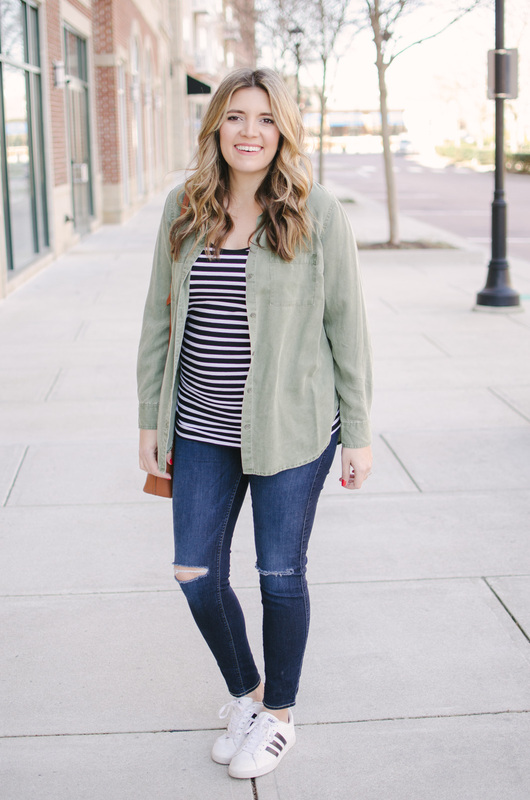 (And if you’re on the hunt for the perfect maternity jeans, you have to check out my maternity jeans review post!) But for summertime, I swap them for a pair of shorts. The exact bottoms truly don’t matter. If you’re into skirts, go with that! Bottoms can be denim, colored jeans (white, black, pink. etc. 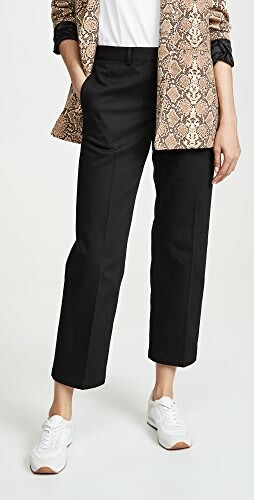 ), or even other options like cropped ankle pants or cargo pants. I just typically prefer them to be more fitted. 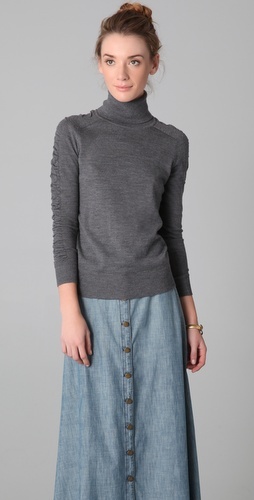 Since I’m a jeans-and-a-tee kinda gal most days, the next piece I’m always reaching for is a tee! I love striped ones, patterned ones, or solids. For summer, I’ll switch to tanks! As far as my favorites go, I’m pretty partial to Old Navy tees! I still have several from my first pregnancy four years ago! Lastly, I add a completer piece! For this time of year, there are quite a few options! And the best part is these can come from your regular wardrobe. 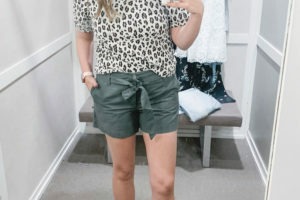 No additional maternity pieces! 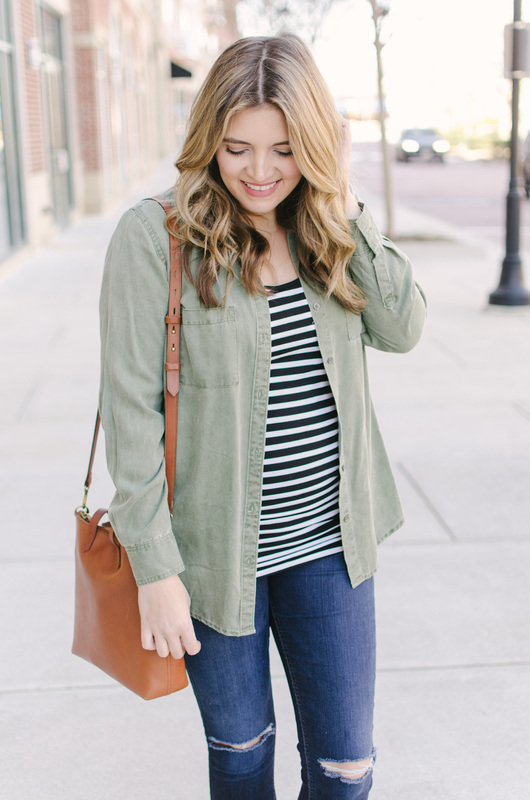 I love the ease of adding an open button down like this olive tencel top. Chambray button downs are another go-to, but I also like plaid options! Gingham works well for spring and summer while classic tartan plaids are perfect for Fall! I also love adding a jacket for a heavier layer. 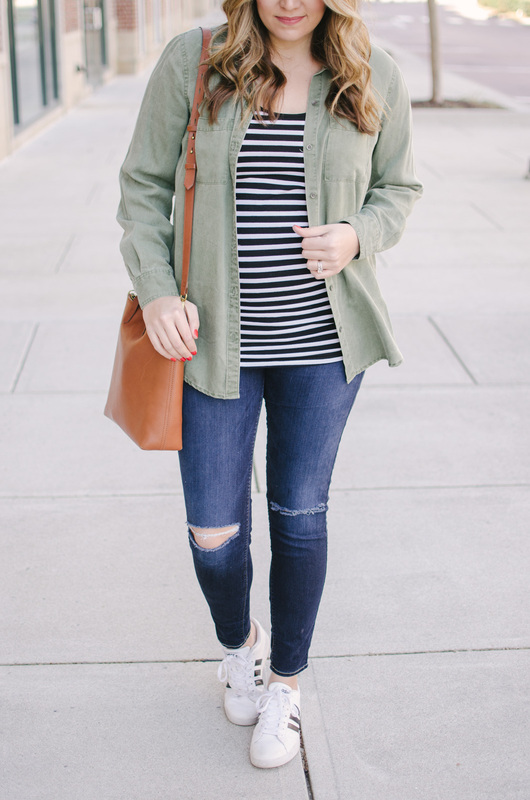 Cargo jackets, denim jackets in all colors, and printed jackets are my fav! Want to be cozy? Go for a comfy cardigan! For a more tailored look, try a blazer! Yep, you can totally wear this outfit combo to work with slim cut pants and flats or heels! Honestly, I probably could create one hundred versions of this outfit in my closet. 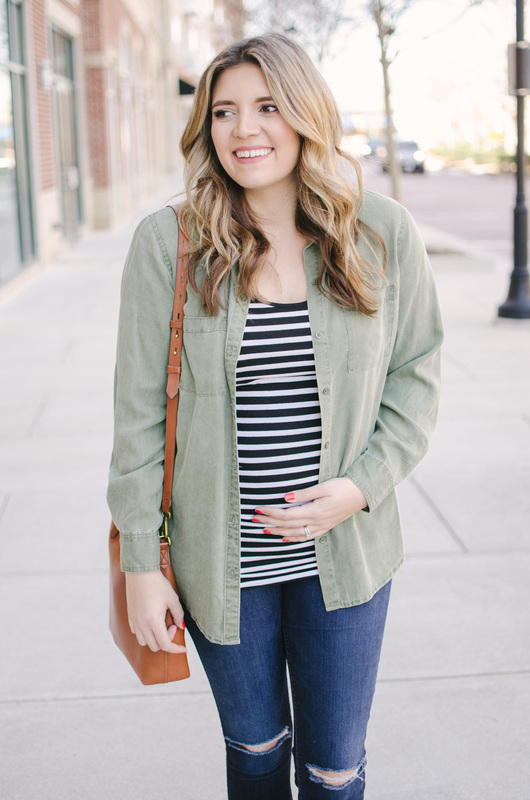 Between white jeans, dark washes and light and all of the classic button downs from patterns to solids could easily make up months of maternity outfits! 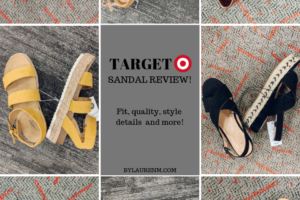 Then swapping sneakers for sandals (even heeled versions to dress it up) and accessories can change the look up even more! Again the best part is that you probably have a lot of pieces already in your closet ready to wear! 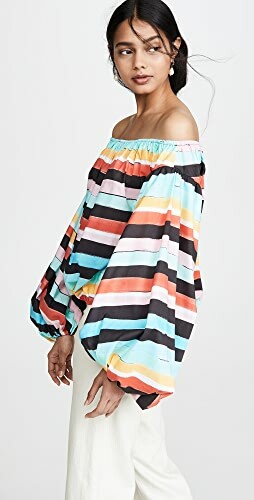 Just add a few tees and bottoms, and your set for your casual maternity wardrobe! Hope you are having a great start to your week! I’ve lost my voice so not the best week for me, haha! Oh, I can totally see myself wearing this. I work from home and I take care of the house as well so I’m always running around going from doing chores to writing emails. 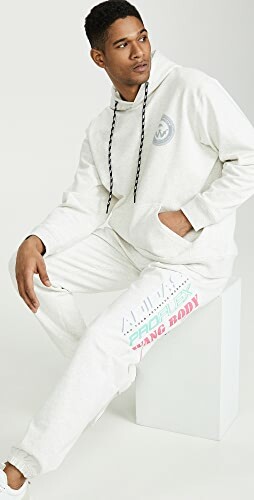 This is such a comfortable outfit that I can wear in and out of the house without there being too much of a problem. Also, I forgot to say congrats on the new baby, Lauren! That really is the perfect go-to look, and I love your gorgeous bag. Shop Ivory Wedding Dresses, Grey Long Sleeve Tees, High Waist Flare Pants, Denim Mini Skirts and more. Get this widget.